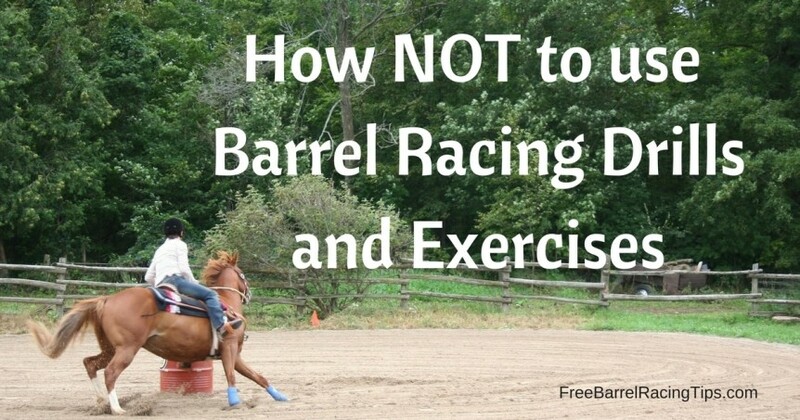 Barrel racing drills and exercises have been used for years to train and school barrel horses. An important point I want to make is that while the word used is “drill” this doesn’t mean you need to drill these exercises into their head or drill them into the ground doing them. Exercise is maybe a more appropriate word to describe what we’re actually doing. What we’re doing is often teaching the horse a maneuver or fixing a problem on the pattern – off the pattern. We can use a drill (or exercise) to get our point across and train without adding any extra pressure on the barrel pattern itself. For example, if your horse is shouldering a barrel, much of the problem can be solved outside of the actual pattern. Perhaps you could put three barrels in a row (above) and practice only first barrel since that’s the only place it’s happening. We don’t need to expend the energy turning second and third to fix the problem at first. We can use a drill to save your horses body and energy. What I like to do is fix the problem off the pattern using a drill and then come back to the pattern to test my work. Sometimes the problem does need to be solved on the pattern, but you can also add an exercise right on the pattern too. Often, you can fix a problem on a barrel without even turning a barrel to fix it. (The image above is showing perfect circles around each barrel in blue and a first barrel turn in purple. Two ways you can use this setup). Every drill and exercise is like a tool in your toolbox. There are many drills I have in my tool box that I don’t use very often, but they’re sure handy to have in my back pocket when I need them. Then there’s the tools we use often (like the Phillips screwdriver). I use the same direction barrel drill almost every time I ride in the arena and the barrels are up. It’s on the top of my tool box. I’m sure other trainers have a different “go to” drill and it will depend on the horse you’re riding too. Each horse usually has a weakness we have to keep tabs on so we’ll have a go to drill or two to keep them in check. We can use drills and exercises to train and prepare a horse for the pattern as well. Exercises can help us teach different maneuvers that are necessary on the pattern. They are another means of getting the job done that can really help take the pressure off the pattern. It’s kind of like how my son, who is in grade 1 learns through games. They play games like rolling the dice and playing Bingo to learn numbers and letters. They are learning, but it’s a fun environment for learning. Ultimately, I like to teach my horse these maneuvers so that when we head to the pattern they are broke enough and have the right tools to lope through the first time. I’ve had a “thing” for drills and exercises since I went to my first barrel clinic in my early teens. I kept a book with drawings of every drill I learned and came across. What I ended up doing with this binder, was putting together a website that you can pay to access over 80 of these drills all online. 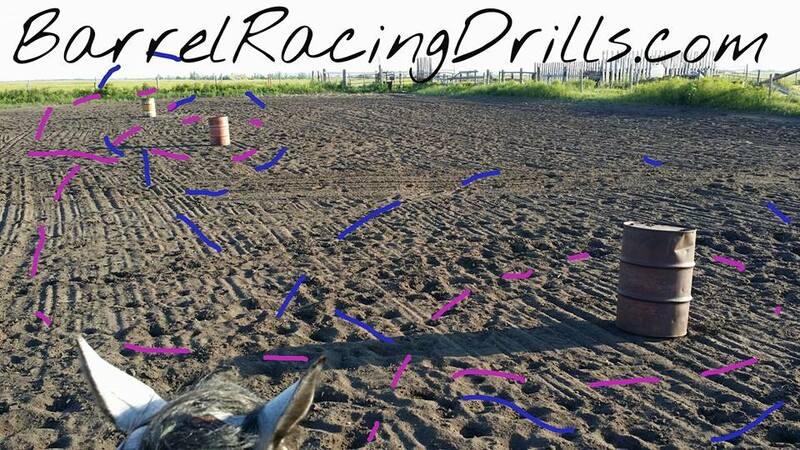 If you’d like to check it out, go to www.BarrelRacingDrills.com to learn more and purchase a pass and have access to them. It’s organized in such a way you can find training drills or problem-solving drills as well as hone in on a problem like “shouldering” and find all the drills I have for that. As with any training method, remember to use moderation. Don’t drill them into the ground. Listen to your horse and remember to keep it fun and switch things up. If one drill isn’t working, try another, it might be just the ticket you’re looking for.